8/24 Cup of Coffee: While the Spinners and PawSox suffered tough losses, it was a great day for the Sea Dogs, Salem Red Sox and the Drive. An eight-run inning from the Sea Dogs lineup coupled with strong performances from Aaron Wilkerson and Williams Jerez on the mound made for an impressive lopsided victory. Daniel McGrath dominated for the Red Sox, and the combination of Luis Ramos and Jamie Callahan preserved a shutout for the Drive as they fight for a playoff spot. Starter William Cuevas was sharp aside from the third inning, when he allowed a walk and home run. Over six innings, he allowed just one other hit and two more walks, striking out seven. Cuevas has been very solid in his first four starts for Pawtucket, posting a 2.63 ERA over 24 innings. Reliever Robby Scott preserved a 2-2 tie with three shutout innings, giving up just two hits and fanning three. But Pat Light struggled in the 10th, walking three straight batters with two outs. Two of those runners would score to give the IronPigs the lead. The PawSox offense managed just six hits on the afternoon, with both of their runs coming on Deven Marrero's sixth home run of the season. Allen Craig went 1 for 3 with a double and a walk, and new addition Chris Marrero went 2 for 4 with two singles. It was an all-around good day for the Sea Dogs, as the offense exploded for eight runs in the fourth inning, the team's biggest inning since scoring nine runs against the Senators back in 2012. All eight runs came with two outs. Third baseman Dustin Lawley drove in two runs with a solo home run and a double. Sam Travis had a nice day at the plate, doubling twice (both in the fourth inning), driving in two runs and working a walk. Manuel Margot drove in a run with a double, and Tim Roberson went 2 for 5. Aaron Wilkerson shined on the mound, going seven innings (for the second straight start), allowing just two hits and two walks, punching out seven. Williams Jerez followed up with two nearly spotless innings, striking out three. 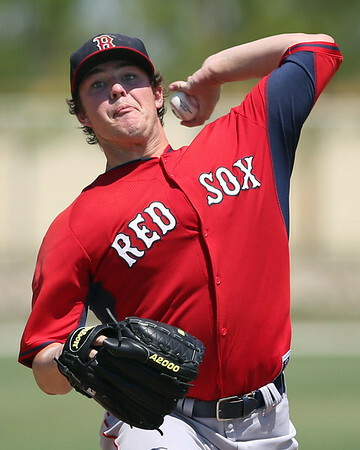 The good pitching continued in the Carolina League, as Daniel McGrath gave the Red Sox six scoreless frames in one of his best starts of the season. McGrath struck out eight, allowed two hits and didn't walk a batter. Brandon Show followed up with three solid innings, allowing one run on one hit. Kevin Heller came through with a big hit, driving in two with his sixth homer of the season and bringing home another with a sacrifice fly. Mauricio Dubon went 2 for 4 with a run scored, and Wendell Rijo manufactured a run with his speed, stealing third and scoring on an error. He finished the day 1 for 3 with a walk. Luis Ramos started the game and was excellent, giving up five hits and a walk and earning his second win of the season. Jamie Callahan picked up where Ramos left off, tossing three nearly perfect innings, allowing just one baserunner on a single and facing the minimum through three frames as that runner was caught attempting to steal second. Callahan fanned three and picked up his third save. The Drive runs came all in one bunch in a fifth-inning rally started by Joseph Monge's double. Singles from David Sopilka and Bryan Hudson, as well as an error and costly passed ball scored two runs. Danny Mars brought home the other two runs with a two-out single. At 26-30, the Drive will need a big push down the stretch to grab the wild card, as they currently trail Asheville (COL, 33-22) with 14 games remaining. The Spinners eked out just four hits as they were shut down by Staten Island. Kyri Washington had two of those hits, both singles, and a walk. Tucker Tubbs reached twice with a hit and walk, and Chad De La Guerra singled. Austin Glorius was lights-out once again, following up his one-hit performance with four shutout innings, allowing three hits and two walks. But Matt Kent had some trouble over five innings of relief, giving up all four runs (though only two were earned) on six hits. Kent took his first loss of the season, and even with the rocky outing, still owns a 1.71 ERA through 42 innings. The Spinners are still firmly in the playoff picture in the New York-Penn League, trailing Tri-City (HOU) by 3 1/2 games in their division with 15 games to go. Player of the day: Daniel McGrath earned his first win since April 26 in what was a terrific outing. His eight strikeouts were just one shy of his career (and season) high, and McGrath struck out five of the first eight hitters he faced. McGrath scattered two singles over his six innings. Also impressive was the fact that for the second straight outing, McGrath didn't walk a batter. McGrath has shown flashes of brilliance throughout the season, though he hasn't shown much consistency in 14 Carolina League starts.